To help students stay organized and clutter free, I have a place on a table in the back of the room where all the corrected papers get piled. Every Friday, I assign two students to sort the papers by name and they put them into folders that are also kept in the back of the room. On these folders I have columns. There is a column for the date, teacher comments, a behavior grade for the week, and parent signature. Once the folders have been stuffed, I quickly write my comments and the kids bring everything home. The folder comes back empty every Monday with a parent signature and response to my comment when appropriate. * This system is great not just for avoiding cluttered desks, but it is a quick and easy way to communicate with each parent on a weekly basis. If I have a note to send home to a parent, I put it in this folder and write in the comment space, “See note inside”. If there is a low test grade in the folder, to ensure that the student doesn’t “ditch it” on the way home, I write in the comment space, “60 on math test”. The parents LOVE this system too! * There are envelopes specifically designed for this system that you can purchase through most large school supply companies. The envelopes are called “HOME/SCHOOL ENVELOPES”. Every morning my kids put their homework folder on their desk and have silent reading time. While they are busy with that, I take my checklist to each student and look at their homework. This way I can immediately see if their name is on it, if they’ve finished it and if they indeed brought it in. This method eliminates no-name papers, and the “I swear I turned it in” blues. I am also able to help those who didn’t understand the homework so they can get it done during recess. I got tired of students claiming –“I turned it in. You must have lost my paper.” After collecting an assignment, I automatically staple the stack together. That way, it is impossible to “lose” one student’s paper. If I “lose” one, then I lose all! a red 5 minute tag for those who are talking during no talk time. They have to give up 5 min. of playtime. If more than one 5 min. tag is on the board by their name that day they have to write a note home telling mom and dad what is going on and have it signed. a blue “math helper” tag. The actual helper of the day chooses this person to hand out all math papers we will need to the kids’ desks while all others are at the meeting wall in the morning. a purple “unfinished work” tag This way anytime someone does not finish work before it is time to move on, they put a purple tag by their name, then take the paper back to my desk and place it in the “unfinished work” tray. This has helped with organization of papers and classroom control. Collecting papers can be such a nuisance, especially with frequent no names. Next to your completed homework/assignment folder, place an attached highligher and pencil. Have the students highlight their name every time they turn something in. If they forget, they can use the pencil, and then highlight. 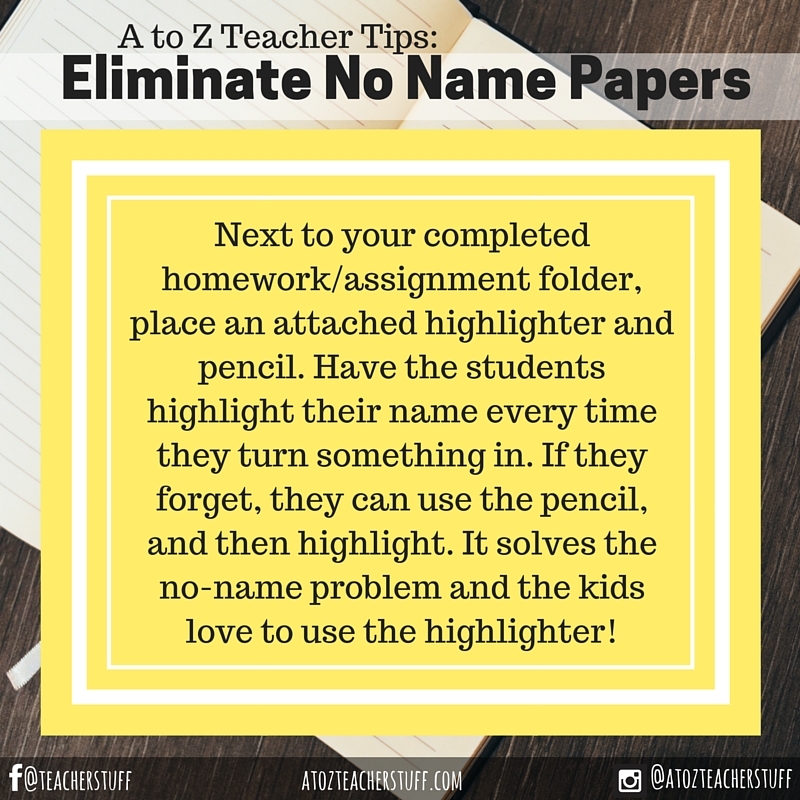 It solves the no-name problem and the kids love to use the highlighter! This tip will help organize morning work and independent work throughout the day. I used two shallow boxes (plastic baskets could also be used) and labeled one with “Finished Work” and the other with “Work in Progress”. I placed these boxes in front of my desk and as students completed their written assignment they put their work into the box labeled “Finished Work”. When time was up the students with incomplete work placed their papers into the box labeled “Work in Progess”. I would count both boxes to make sure all work was accounted for and allowed students with unfinished work time during the day to complete it. This method works really well for me because it helps eliminate papers being lost in desks! Take 25 or so file folders and fold a posterboard in half. Glue one file folder on the top of the posterboard. Continue to lay the file folders on top of each other leaving the tab showing. When you are done, you should have 25 pockets to fit papers in. 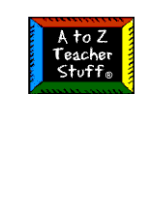 Label the tabs with student’s names. Lay it flat somewhere in your room that the children can reach. I teach my children how to file their own papers throughout the day. As I grade or check papers, I then return them to that child and they file it themselves. I never have to file one paper! On Fridays I pull the papers, staple them together, and put them in a pocket folder to go home on Mondays. I use daily communication folders for my special education students. First thing in the morning they bring their folder and place it in their “mailbox”. I read any notes or information from their parents. During the day papers come from the office to go home or notes from me are placed into the child’s mailbox. At the end of the day the students are given a few minutes to put all their papers into their folders, ready for their parents to read. This cuts down on the amount of time I have to run around making sure those important notes don’t get lost on their way into the backpacks. During the first week of school I assign everyone a number. I usually just go down the roll book and assign the numbers in alphabetical order. I instruct the students that each time they turn in a paper the number should be in the right hand corner of the paper. When all papers are collected I put the in order and I can quickly check and see if anyone has not turned a paper in. This works great and is fast. In an open file box I place hanging files that are marked IN 1st. hr., IN 2nd. Hr., and so on. Behind that group of files, I do the same with OUT 1st Hr., etc. This way students place finished work in the IN file, and I place corrected work in each hour’s OUT folder. A student teacher then passes back the work each day. I also color code my folders for each hour! I found an inexpensive way to hand back student’s papers that is very easy and doesn’t take a lot of time or classroom space. I purchased one of those hanging file folder bins with a handle lid at Walmart (or Target) for about $4. I put a hanging file in it for each student with their name on it. When I’m finished correcting papers I put them next to the bin and my teacher helper files them away. At the end of the day the students empty their folder into their take home folder. I don’t have the problem of papers being shoved into desks. I label a file folder for each student and place them in a deep box. I keep a shallow box next to it. As soon as I have graded papers and am finished with them, they go into the shallow box to be filed into the folders. This “center” can be manned by up to 2 students at any time (provided the students have all work completed!). The students have the chance to be responsible, learn filing skills, and help their teacher (!). It saves me time, as well. On Friday, I send all papers home. Even if we are short on time, “Viola!”, every paper is filed and ready for home! An easy way to make sure the students have his or her name on their paper have them draw a shape beside their name before turning it in. So when you go to collect the home work tell the class to draw a happy face by their name (you can have a different shape for each day). This eliminates any “nameless” papers! To help teach organizational skills and to keep track of unfinished class work, I use a file crate. Each child has a folder with his/her name and a number. If we run out of time to work on a project or paper, it goes in the folder until we have free time again. This also keeps papers from getting wrinkled and torn in the desks, or taken home by mistake. If you use a number system to sort and grade papers, you can also have each student write his/her number on the paper along with his/her name. Because keeping up with papers from each student in each subject can be overwhelming, I’ve added onto the idea of assigning student numbers in the classroom. When students head their papers, they are required to include their personal numbers based on alphabetical order. At the end of the day, papers are collected and put in “ordinal position” by students. I have a quick record of which papers are missing. When papers are graded, student helpers file the papers in individual file folders for the students to check. The folders are kept in a basket in the back of the room and I don’t waste valuable time passing papers to students. This tip works with all grade levels. I send home a Weekly Folder with a Weekly Progress Report for each student. The folder goes home on Mondays and the parent receives a report about the child’s behavior, homework, classwork, and all tests are returned from the previous week. The parents sign and return the folder and if they have questions or concerns, they address them to me on the report. This method eliminates confusion that parents may have about their child’s progress. It also lets them know that I care enough to take time on a weekly basis to communicate with them. My students love it and so do their parents!